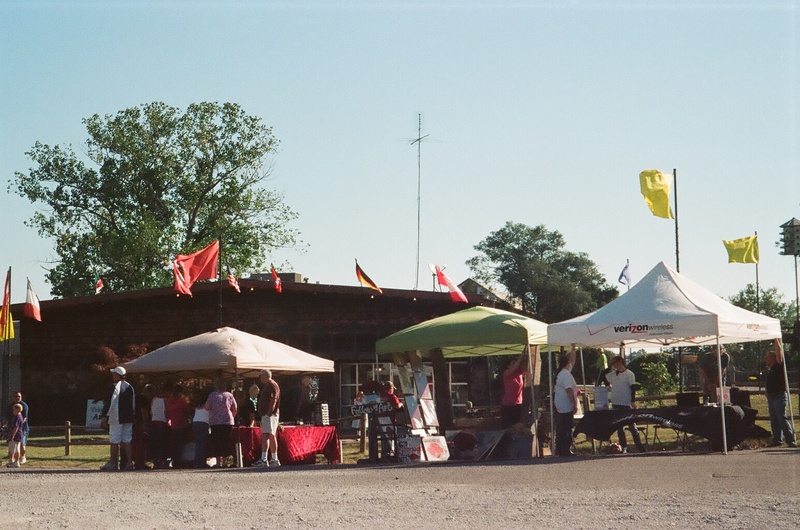 Last weekend L and I took the Girls and attended the Wiederkehr Wine Festival in Altus, AR. The Girls and I had been once several years earlier, but had arrived late in the afternoon and missed most of the events. L had never been before, but claimed to be up for the adventure. So bright and early Saturday morning we packed a quick lunch, grabbed the camera, and headed down south to enjoy the festivities. While heading down the driveway L and I discussed (argued) about the best route to take going there. We intended to come back through Alma and stop at a store called A-Z so the route back was set, but the route down was still open for discussion and disagreement. We quickly called upon "Big Momma" our trusty GPS for an unbiased weigh in on the subject and were soon on our way down the pig trail. Let me just take a moment to say the pig trail, officially known as the Pig Trail Scenic Byway, is approximately 20 miles of the most twisted and curvy road you could ever imagine. Through the years I have made that trip in cars, trucks, trucks with RV's attached, trucks with cattle trailers attached, vans, and school buses and I can't honestly say I have ever enjoyed that trip. But there are times when it is quite simply the quickest way to get from point A to point B and therefore down the pig trail we'll go. We arrived shortly after 9 a.m. and the party was just getting started. The first item of business was to convert our money. Rather than paying for activities and food with cash, you purchase tickets and then pay with them. I suppose this makes the process easier for those running the concession stands and rides, but it proved to be somewhat complicated for us. Part of the confusion stemmed from the fact that the moment we saw bratwurst on a bun with kraut we all knew there would be no we'lljustbringsomethingfromhome lunch for us. No sirree!! "We'll take forty tickets please! and Thank you!!" Then we were off to join in the fun. L and I offered the Girls the opportunity to participate in the grape stomping contest, they declined. So we took a tour of the vineyards instead. The vineyards are very impressive and the view was amazing. There was even a small metal tower used as a lookout point. The look on this camel's face just screams "prelude to spit"! I decided at 10:30 to participate in the free wine tasting. I left the Girls with L and bellied up to the bar. The couple I was standing next to were in costume, which I found to be very entertaining. There were a total of five wines to taste and for the most part they were good. There was one, however, that made me think someone was wearing an old pair of gym socks when they stomped those grapes. By the time I joined L and the Girls it was lunch time. So we took our ticket currency and headed over to get our much anticipated bratwurst on a bun with kraut. When we placed our order the girl told us it had been determined that the bratwursts were too long for the buns and therefore our choices were now bratwurst on a stick, or sausage on a bun, and would that be alright? For several different reasons this was not alright. First of all we like kraut on our brats and I'm pretty certain you can't eat kraut on a brat on a stick. Second, we don't like sausage. And thirdly, that would really mess up our currency to tickets conversion and we couldn't have that. So after explaining to her that we didn't mind an oversized bratwurst on an undersized bun, she yanked four of them off the stick to accommodate us. We took our happiness in a syrofoam box and grabbed a seat in the dining tent where a German sing-along band had just started. I commented that I had no idea what they were saying but I really liked it. GG responded with, "I remember a few words from my German class in 4th grade. I'll let you know if they say hello or goodbye." After lunch L went over to the funnel cake vendor to get dessert. I told him to get two large cakes and two extra plates and we would share. He came back with two large cakes and one extra plate, and then told me they gave him one extra plate and offered to cut it in half. I think he was a little irritated by this but I personally found it to be somewhat funny. Still do. We stopped in Alma to do a little shopping at A-Z before going home. We made a quick tour through the Gifts store, and then L dropped the Girls and I at the Fashions store before continuing on to the Sporting Goods store. Twenty minutes later we located him in the camo section trying to make his final choice. That's right, L spent more time clothes shopping than I did! Make a note!